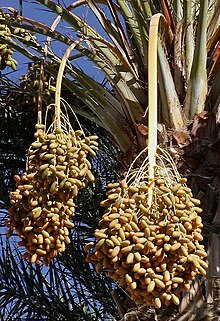 The date palm is a tree. It has been cultivated for a very long time because of its fruit. The tree is between 15 and 25 metres (49 and 82 feet) high. It has long leaves that look like feathers. Such leaves are called pinnate. The leaves can grow to 3 to 5 metres (9.8 to 16.4 feet) in length. The leaves have visible spines. There are about 150 leaflets. Each leaflet can be up to 30 centimetres (12 inches) in length and 2 centimetres (0.79 inches) in breadth. The full span of the crown of the tree is 6 to 10 metres (20 to 33 feet). The tree has one or more trunks. All the trunks come from a single system of roots. Iraq used to be a major producer of dates but in recent years production and exports have fallen considerably. The First International Date Conference was held in Tripoli in 1959. In that conference, it was decided to develop a special program under the Food and Agriculture Organization of the United Nations to promote the commercial use of substandard or physically defective dates. This page was last changed on 2 April 2019, at 12:25.